Louisa Wanda Strentzel was born in Texas in 1847. She came to California in 1849, the same year that John Muir was coming to Wisconsin from Scotland. So much has been made of Muir's life that Louie's life and contributions are hardly known. This brief paper is a tribute to Louie and to the help and support she gave her husband in his work. Louie was a wonderful musician, wife, mother, ranch manager and helpmate. Muir did not relegate Louie to an anonymous life in the background -- this is what she herself preferred. She stayed close to home because she wanted to, preferring not to be away more than a day or two. Certainly she was not inclined to camp out on an Alaskan glacier or even to take a walk in the hills nearby their Alhambra Valley home. Daughter Helen's July, 1963 letter contains a rare look at Louie and forms much of what we know about Louie. In 1849 the Strentzel family came to San Diego, California by covered wagon and then settled along the Merced River. The family operated an inn and then a farm where Louie's father, John Strentzel, began horticultural experiments. After three years in that area, they moved to Cantilde;ada del Hambre (Valley of Hunger) in 1853 and camped out until their first house could be built. Louie's mother, Louisiana Strentzel, disliked the name of the valley (Spanish soldiers had been unable to find food and nearly starved) and renamed it Alhambra Valley for the popular story published in the mid-1800s by Washington Irving about the Alhambra palace in Spain. In 1859 Louie's formal education began as a day student at Miss Atkins Young Ladies Seminary across the Bay in Benicia. The Young Ladies Seminary (YLS) opened with 25 students in 1852, founded by local citizens. 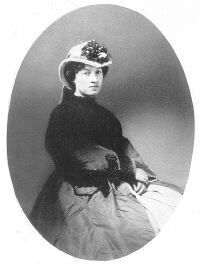 Miss Mary Atkins became the principal in 1854 and was placed in full control in January 1855. Later in 1855 she paid $2495. for the buildings and property and became owner as well as principal. Mary Atkins was born in Jefferson, Ohio, in 1819 and was an 1845 graduate of Oberlin College. She came to California via Panama in 1853. The seminary was located in an old residence built by a Captain Randall at 153 West I Street between First and Second Streets. Young ladies in search of culture and grace arrived by steamship and horse from various cities in the U.S. including the gold mining towns and from South America, Hawaii, and Mexico. At YLS a neat personal appearance was important notwithstanding the admonition that "no student is to tarry before a mirror for more than three seconds." The 1863 YLS catalog lists departments in English, Language (Latin, French, German, and Spanish) and Fine Arts (Music, Painting, and Drawing). The 1868 commencement audience included Samuel Clemens. Cyrus Mills, a graduate of the Union Theological Seminary in New York, met Miss Atkins in Hawaii while the latter was on vacation there. Apparently she wanted to sell the school, for Mills inspected the property later and purchased it for $5000. on October 7, 1865. By that time Benicia had four schools: the Episcopal School for Boys, the Catholic School for Girls, C.J. Flatt's Benicia College, and the Young Ladies Seminary. Mills' friend Dr. I.E. Dwinell, pastor of the Sacramento Congregational Church, accompanied Mills on his inspection visit to YLS. In 1880 Dwinell married Louie and John. Mills had purchased property in Alameda County and in 1870 broke ground for Mills College there. In May, 1870 he announced that the next YLS semester would begin August 2 at the new location. Eventually Dr. Dwinell became a trustee of Mills College. In 1877 Mary Atkins returned to Benicia from Ohio and reopened the old Randall house as a school for girls. This year there were 25 students, the same as when the school first opened in 1852. Louie Strentzel took the ferry "Carquinez" each day over and back. At the YLS she studied everything from English to Entomology and became a music scholar on the piano. Each day each student was graded, and Louie's report from March 12, 1860, by Mary Atkins, survives. Louie was graded on 22 different subjects and scored a perfect 10 on virtually all of them. Miss Atkins noted that the "Examination passed very creditably. It was an honor to the school." Among the classical piano pieces Louie learned was Beethoven's Sonata Pathetique. This piece requires considerable musical talent, and we can appreciate the skill on the piano which Louie possessed. If Louie hadn't married Muir, she possibly could have had a career in music had she wanted to. What we know about Louie's music comes from her mother's diary and from some of Louie's sheet music returned to the John Muir National Historic Site by granddaughter Jean Hanna Clark. Louie graduated in May, 1864. A copy of the Strentzel's invitation to the Annual Examination of the Pupils survives. For the next fifteen years after graduation from YLS in 1864 Louie was at home with her parents. During that period she learned a great deal about fruit ranching, hybridizing, and flowers, and she continued her study of the piano. Louie first met John Muir on September 15, 1874 at the home of Dr. and Mrs. Carr in Oakland. That same year Dr. Strentzel was organizing the Alhambra Grange, an association of local farmers. In 1876 he built Granger's Wharf and warehouses into the Carquinez Straight portion of the Sacramento River off the Martinez shore. Music was a central theme at the semi-monthly Grange meetings on the first and third Saturdays at 2 pm in the Hall, and Louie played from the Grange song book at those meetings and for her father. One song he particularly liked was named "Hold The Fort." The melody for that song was used in England by the Transport Workers Union and known as "Storm the Fort, Ye Knights of Labor," and by the labor unions in the Eastern US in the 1800s. On June 1, 1878, Louie played the piano for the Strentzel family and John, and they all sang several Grange songs. Muir commented to Mrs. Strentzel that they almost made a Granger of him that day, and she recorded that in her diary. But in 1882 Muir stated his opposition to the Grange. Between 1875 and 1879 Mrs. Jeanne Carr was a frequent visitor to the Strentzels. Mrs. Carr was the wife of one of Muir's professors at the University of Wisconsin and the two corresponded for several decades. She had for years been trying to match up Louie and John, and in 1879 the pressure became intense, with Mrs. Carr working over the two of them separately. Eventually Muir gave in to her perseverance and on June 17, 1879 they became engaged, the day before Muir's first trip to Alaska. On a very stormy April 14, 1880, they were married in the Strentzel's white house with white Astrakan apple blossoms decorating the home. A copy of their Marriage Certificate, signed by Dr. Dwinell and witness Mrs. M.A. Hatch, survives. Dr. Dwinell was known to both families: He founded the Sacramento Literary Institute to which Muir lectured in 1876 and 1879; and he was a good friend of Cyrus Mills who purchased the YLS from Miss Atkins in 1865 and who later founded Mills College in Oakland. Muir would have liked Dwinell because of his literary and scientific interests -- he also founded the Agassiz Institute in 1872 following a visit of Louie Agassiz to Sacramento. The Muirs' daughter Wanda was born March 25, 1881, and daughter Helen on January 23, 1886. Helen's room overlooked the train track, tunnels, and trestle, on the side of Mt. Wanda. She became fascinated with trains and plastered her room with posters from the train companies, learned the timetables, and watched for expected trains coming around the mountain. Both girls accompanied their father on walks in the nearby hills, and Muir named two of the peaks Mt. Wanda and Mt. Helen. Eventually the girls wanted music lessons. They were interested in the violin, guitar, and piano and needed to practice. Muir was distracted easily from bookmaking in the upstairs Scribble Den and couldn't stand the sounds of nearby practicing. Eventually he relegated the girls' practicing to the soundproof brick room supporting the water tank at the rear of the house. Later that became known facetiously as the Music Room. Probably Louie couldn't play the piano when he was working, and likely she did most of her playing while he was gone. Also while Muir was gone, Louie managed the fruit ranch very capably, handled the finances and bookkeeping, and even sent checks to cover Muir's hotel bills. In 1884 Louie accompanied her husband to Yosemite Valley. It was her first and only trip there and was a mistake from the start. She mistook trout for catfish, didn't like hiking about, and saw bears behind every tree. Muir also grumbled about the cost of transporting her several trunks of clothes. "Dear John, A ranch that needs and takes the sacrifice of a noble life, or work, ought to be flung away beyond all reach... The Alaska book and the Yosemite book, dear John, must be written, and you need to be your own self, well and strong to make them worthy of you. Ever your wife, Louie." Soon Louie began to sell off the ranch property to lessen the burden. Louie Muir died on August 6, 1905 and is buried with John, her parents, a brother, a sister and Uncle Henry in the Strentzel/Muir cemetery about a mile from the National Historic Site.